fishhook is a very simple library that enables dynamically rebinding symbols in Mach-O binaries running on iOS in the simulator and on device. This provides functionality that is similar to using DYLD_INTERPOSE on OS X. At Facebook, we've found it useful as a way to hook calls in libSystem for debugging/tracing purposes (for example, auditing for double-close issues with file descriptors). dyld binds lazy and non-lazy symbols by updating pointers in particular sections of the __DATA segment of a Mach-O binary. fishhook re-binds these symbols by determining the locations to update for each of the symbol names passed to rebind_symbols and then writing out the corresponding replacements. For a given image, the __DATA segment may contain two sections that are relevant for dynamic symbol bindings: __nl_symbol_ptr and __la_symbol_ptr. __nl_symbol_ptr is an array of pointers to non-lazily bound data (these are bound at the time a library is loaded) and __la_symbol_ptr is an array of pointers to imported functions that is generally filled by a routine called dyld_stub_binder during the first call to that symbol (it's also possible to tell dyld to bind these at launch). In order to find the name of the symbol that corresponds to a particular location in one of these sections, we have to jump through several layers of indirection. 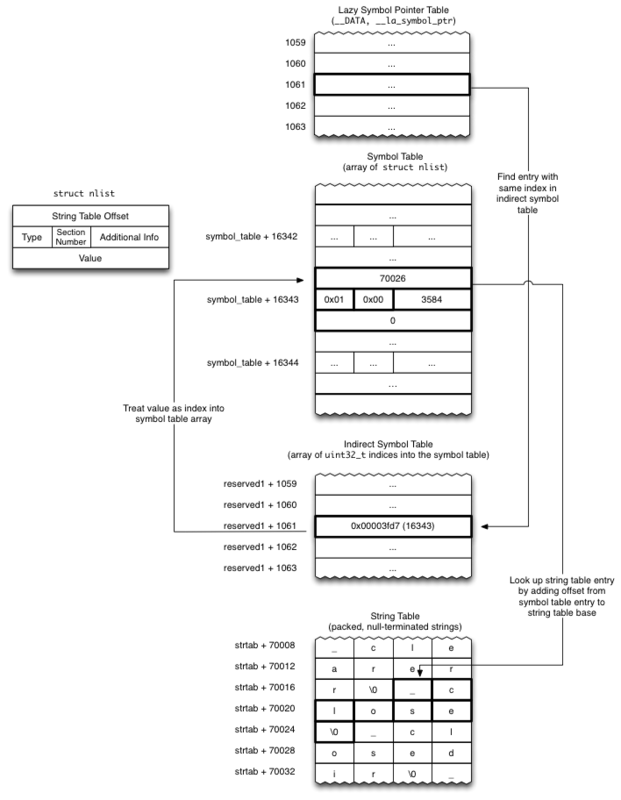 For the two relevant sections, the section headers (struct sections from <mach-o/loader.h>) provide an offset (in the reserved1 field) into what is known as the indirect symbol table. The indirect symbol table, which is located in the __LINKEDIT segment of the binary, is just an array of indexes into the symbol table (also in __LINKEDIT) whose order is identical to that of the pointers in the non-lazy and lazy symbol sections. So, given struct section nl_symbol_ptr, the corresponding index in the symbol table of the first address in that section is indirect_symbol_table[nl_symbol_ptr->reserved1]. The symbol table itself is an array of struct nlists (see <mach-o/nlist.h>), and each nlist contains an index into the string table in __LINKEDIT which where the actual symbol names are stored. So, for each pointer __nl_symbol_ptr and __la_symbol_ptr, we are able to find the corresponding symbol and then the corresponding string to compare against the requested symbol names, and if there is a match, we replace the pointer in the section with the replacement.